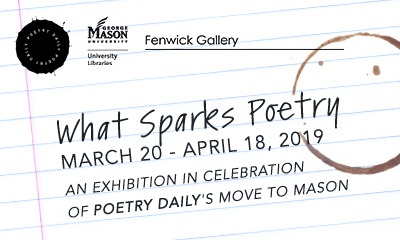 Fenwick Gallery at George Mason University is pleased to host “What Sparks Poetry,” an exhibition in celebration of Poetry Daily’s move to George Mason University. The exhibition will be on view from March 20 through April 18, 2019, with a panel discussion presented by members of the Poetry Daily editorial and publication team on Thursday, March 21 at 6:45pm. This event immediately precedes the Visiting Writers series talk with poet Ilya Kaminsky at 7:30pm in the Fenwick Library Reading Room. Poetry Daily is a popular daily online anthology that has been promoting poetry since 1997. In 2018, it began the process of moving to George Mason University where it is now edited and produced through a partnership between the Department of English Creative Writing Program and George Mason University Libraries, in collaboration with the Daily Poetry Association. “What Sparks Poetry” is a new, serialized feature on Poetry Daily in which poets were invited to explore experiences and ideas that spark new poems. The “What Sparks Poetry” exhibition comprises the handwritten pages and essays by a number of these notable poets—intimate homages to the relationship between poet as reader and poet as writer, and to what sparks poetry. Poetry Daily’s editorial board includes seven poets from Mason: Aaron McCollough, director of George Mason University Press and Mason Publishing in the University Libraries; Mason Creative Writing program faculty Jennifer Atkinson, Heather Green, Eric Pankey, and Susan Tichy; and Vivek Narayanan of the Honors College. The board includes nine other notable poets from across the country: Kaveh Akbar, Jennifer Chang, Yona Harvey, Layli Long Soldier, Amaud Jamaul Johnson, Ilya Kaminsky, Sandra Lim, J. Michael Martinez, and Brian Teare. Find Poetry Daily online at http://www.poems.com. For more details on this exhibition and related events, visit the Fenwick Gallery exhibitions page at http://fenwickgallery.gmu.edu/exhibits/poetry-daily.